New technology is coming to the $2 trillion automotive industry in a big way – and smart investors are finding the top companies that could profit from it. In 2017, 94.5 million cars were sold world-wide and demand for light vehicles in every consumer market is soaring. Everyone wants to buy a car. And the industry is expecting another strong year in 2018. But nobody likes to buy a car. Why should they? The current process is inefficient, unnecessarily expensive and time consuming. Now, one little-known company is using new technology to cut out the middle man and has the potential to create new profits for the global automotive industry. In other words: Why should the middle men get the money… when the automotive industry itself can capture more profits using the right technology? 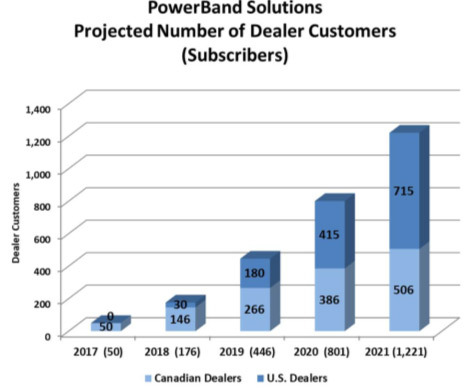 PowerBand Solutions (TSX.V:PBX) is adapting this cutting-edge tech to automotive sales. And they have some of the biggest partners in the industry. These include partnerships with auto dealers and cooperation with firms like Route One, PBS, Quantech, Dealer Socket and more. PowerBand Solutions aims to eliminate the costly added fees and lengthy paperwork that go into each auto purchase. And the potential is huge. By cutting out the middle-man through its fintech technology platform, PowerBand will reduce costs and save their clients between $400 and $1000 on new car sales, and could still realize a profit margin of as high as 69 percent on certain vehicles. The tiny $10 million cap PowerBand could be worth much more as some of that profit flows back to them for their technology as expected. The auto industry is an international behemoth. Each year more than 90 million cars are sold all around the world, and demand is still rising. The biggest auto companies, like Toyota, Volkswagen, General Motors and Fiat Chrysler regularly report billions in profit each year. In the United States, 5 million new cars and 12 million used cars are sold each year, for a total sale of 17.1 million cars in 2017. But there’s a lot of waste hidden inside those sales. Taken across the whole industry, there’s $17 billion up for grabs. That’s a massive opportunity for a company savvy enough to tackle the problem. Buying a car, as everyone knows, can be a long, laborious process. That’s because the middle-men have loaded it down with hidden fees. Some of these fees are necessary for dealers to cover the cost of processing the purchase. That’s because most dealers are STILL using pen-and-paper contracts, with page after page of contracts that need to be processed. This fee has nothing to do with the value of the car. Instead, it goes towards paying the costs incurred by the middle-man from admin and advertising. Included in this cost is the car’s documentation fee (or “doc fee”). Dealers charge a different fee depending on the state, but it can range from $75 in Oregon to $799 in Florida, according to on-line auto dealer Edmunds. The doc fee averages $400, and is often negotiable for purchasers. That’s because in most cases, it’s just an added fee dealers tack on to cover their additional costs. But in other cases, the fees are non-negotiable. Dealers won’t budge if consumers try to talk them down to a lower fee. Together with other assorted fees, the doc fee can add anywhere from $400 to $1000 to the total purchase price of a car. PowerBand Solutions (TSX.V:PBX) applies new technology to streamline the auto purchase process. By cutting out added costs, eliminating administrative waste and removing the need for added fees, as an auction software platform, PowerBand will assist dealers and OEM to dispose of their assets through their buying network, taking on the $100-billion auto-auction industry head first. PowerBand has developed software that allows for faster, easier and more streamlined auto purchases, both through on-line auctions for individual buyers and sellers and for dealers, rental car companies and fleet purchasers. The company has a transaction-based model that charges a total $200 fee from buyers and sellers utilizing the platform. This is significantly less than the $400-$1000 auction houses usually charge. PowerBand is also mastering control of information. The company has developed a standardized electronic appraisal system, one that provides up-to-date information on cars, increasing transparency. Finally, the company provides retailers and customers with retail market price valuations derived from databases. This precise market information gives auto dealers an edge while also letting consumers know where the best deals are. PowerBand intends to apply blockchain technology to its platform. Use of blockchain is intended to help certify vehicle history, financing, mileage, servicing, accidents and more..
With this technology in place, PowerBand (TSX.V:PBX) could be ready to take off. All it needs to do is slide the key into the ignition and start revving its engine. Quantech Software Inc. signed an integration and revenue sharing agreement with PowerBand, linking PowerBand’s auction software with its own dealer management system. Several other firms have signed on to use PowerBand’s tech, as well. PowerBand has agreement with Dealer Socket, which operates in 700 dealerships in Canada and over 10,000 in the United States. The company will use PowerBand’s Auction software to streamline its processes and save money along the way. 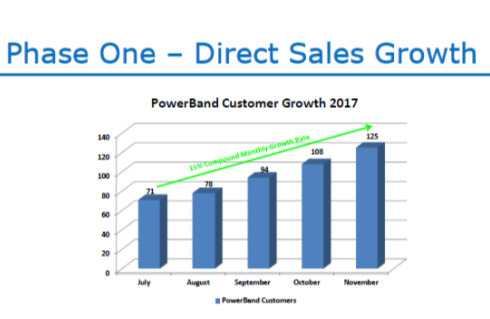 As of November 2017, 125 unique customers had signed on to partner with PowerBand, representing a compound growth rate of 15 percent per month since July 2017. 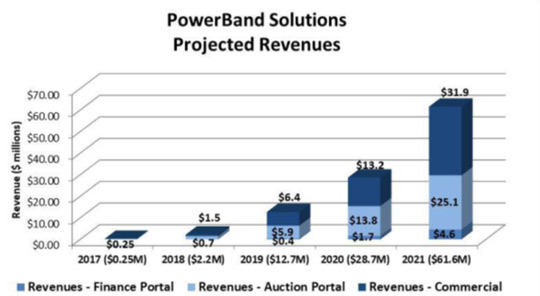 Based on this dynamic expansion, PowerBand projects a growth curve from $2.2 million in 2018 revenues to $61 million in 2021 if Powerband can capture approximately 2 percent of the vehicle auction market. The company has already finished $8 million in financings to date and doesn’t expect to have to raise much more cash since operations are expected to yield a positive cash flow. The transaction cost model generates a profit margin of up to 69.7 percent, meaning, and PowerBand hopes to have over 1,000 dealership customers by 2021. PowerBand is looking at the kind of growth potential you usually see in very fast-growing firms, as their current projections show. They have a real shot at making their projections, based on early results. And in preparation for Phase 3 of its future plans, Powerband has had discussions with IBM (Blockchain-as-a-Service) to develop an automotive industry blockchain platform for certifying vehicle history, financing, mileage, servicing, accidents etc. And with blockchain in the mix, investors tend to get excited. Recently, companies that buy into blockchain or crypto-currency immediately see their share price expand. PowerBand is going beyond the blockchain hype, and is applying this new technology to a real problem: the waste and unnecessary expense from the middle-men in the auto industry. The auto industry is worth an estimated $2 trillion and is wide open to disruption. Innovative companies like PowerBand (TSX.V:PBX) can upend the traditional way to buy and sell cars, eliminating billions of dollars of unnecessary cost. Through their partnerships with firms like Route One, Dealer Socket, Quantech and PBS, PowerBand technology expects to soon be rolling out through North America. This breakthrough will make buying and selling autos easier than ever. To imagine the potential here, consider Trade Rev, another auto disruptor. Trade Rev was entirely bought out by KAR Auction Services in October 2017 for $50 million in cash; an additional $75 million will be paid out over the next four years. “The digital revolution in remarketing has begun,” announced the CEO of KAR. The deal lifts TradeRev’s total value to $150 million. Powerband could attain that same success, or could rise even higher, even faster, if everything it has planned works out. With only a $12 million market cap, this small company aims to have access to thousands of auto dealers throughout North America. It’s utilization of integrated technology sets it above the rest. And its revenue projection is to increase by 3000 percent in the next three years. That would put it in a different league. By cutting out the middle man, PowerBand (TSX.V:PBX) could revolutionize auto dealing. Investors should jump on this blockchain revolution, before this little company shifts into high gear and really takes off. Certain statements in this press release are forward-looking statements and are prospective in nature. Forward-looking statements are not based on historical facts, but rather on current expectations and projections about future events, and are therefore subject to risks and uncertainties which could cause actual results to differ materially from the future results expressed or implied by the forward-looking statements. Forward-looking statements in this news release include expected continued success in software development, access to qualified sales force, continued involvement of current management, automotive industry activity levels remaining constant, receipt of required regulatory approvals, statements that Powerband’s cost savings technology will save new car sellers $400 to $1000 per vehicle, that Powerband could realize as much as a 69 percent profit margin on certain vehicle sales on its revenues, that the enterprise value of Powerband can rise substantially, that Powerband can increase revenues by 3000 percent to $61M by 2021, that Powerband’s technology can be employed by over 1000 dealers by 2021, that Powerband will be able to develop a blockchain system for providing accurate information about a vehicle, that recent revenue growth trends can continue, and that Powerband will continue to sign new partners. Although the Company believes that the expectations reflected in the forward-looking statements are reasonable, there can be no assurance that such expectations will prove to be correct. Such forward-looking statements are subject to risks and uncertainties that may cause actual results, performance or developments to differ materially from those contained in the statements including, without limitation, risks with respect to: that Powerband’s technology may not achieve the expected results and its accomplishments may be limited, that Powerband may not establish a market for its services as expected; competitive conditions in the industry; general economic conditions in the US, Canada and globally; the inability to secure additional financing; competition for, among other things, capital and skilled personnel; potential delays or changes in plans with respect to deployment of services or capital expenditures; the possibility that government policies or laws may change; technological change; risks related to Powerband’s competition who may offer better or cheaper alternatives; Powerband not adequately protecting its intellectual property; interruption or failure of information technology systems; and regulatory risks relating to Powerband’s business, financings and strategic acquisitions. The Company disclaims any intent or obligation to update publicly any forward-looking information other than as required by applicable securities laws. This communication is for entertainment purposes only. Never invest purely based on our communication. Gains mentioned in our newsletter and on our website may be based on end-of- day or intraday data. We have been compensated by Powerband to conduct investor awareness advertising and marketing for (TSX:PBX.V). Therefore, this communication should be viewed as a commercial advertisement only. We have not investigated the background of the company. The third party, profiled company, or their affiliates may liquidate shares of the profiled company at or near the time you receive this communication, which has the potential to hurt share prices. Frequently companies profiled in our alerts experience a large increase in volume and share price during the course of investor awareness marketing, which often end as soon as the investor awareness marketing ceases. The investor awareness marketing may be as brief as one day, after which a large decrease in volume and share price is likely to occur. Contributed by Ian Jenkins of OilPrice.com.